Liven up your menu with full‐bodied, Latino flavor! Developed specially for catering services, restaurants, and other busy culinary environments, Knorr Caldo de Pollo Chicken Bouillon is a Hispanic favorite that delivers flavor and efficiency chefs can trust. This delicious chicken broth base is made from a blend of chicken, onion, parsley, and spices, and it offers a distinctive and vibrant flavor that is ideal for use in traditional Latino recipes, like enchiladas, arroz con pollo, and chipotle chicken. It prepares quickly; simply add it to boiling water to create a delectable broth or soup stock. Packaged in a bulk-sized resealable container, this chicken broth and stock concentrate is perfect for busy kitchens where efficiency is a must. It is shelf-stable and can be stored for long durations while retaining its flavor. 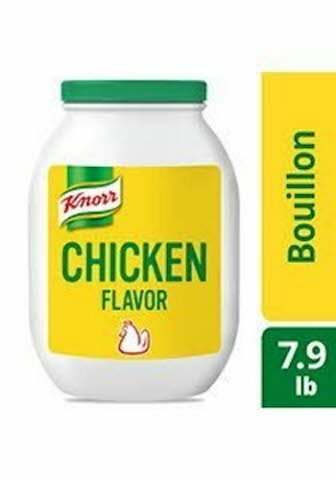 To prepare a delicious chicken broth, simply dissolve 7.9 lbs of Knorr Caldo de Pollo in 38 gallons of boiling water to produce 830 - 6 fl oz servings. Liven up your menu with fullbodied, Latino flavor! These bases offer unlimited versatility across the menu, shelf-stable convenience, superior quality, and no trans fat. Use as a base in preparing soups, moles, sauces, rice, pasta, casseroles and vegetable dishes.